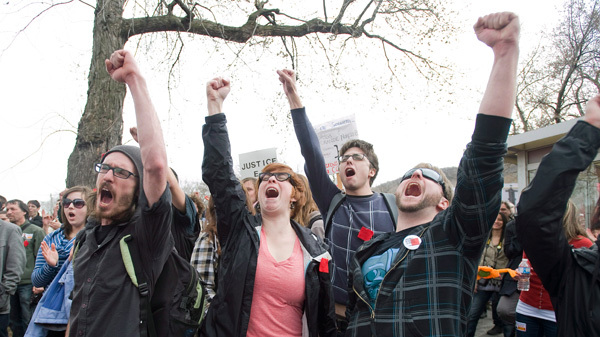 On Saturday, thousands of students in Quebec were joined by residents young and old for a protest against planned tuition hikes that coincided with the anniversary marking Premier Jean Charest’s taking power nine years ago. In Pakistan, a crippling strike paralyzed life in the provincial capital of Quetta on Sunday as people protested Saturday’s target killings of nine people, including eight Hazaras, and the government’s failure to improve the law and order situation. About 30 members of Afghan Young Women for Change staged a protest march in Afghanistan’s capital Kabul Saturday, denouncing violence against women. On Saturday, up to 4,000 opposition supporters marched through the southern Russian city of Astrakhan in support of a hunger-striking local politician who says he was robbed of an election victory by vote rigging. Police arrested about two dozen people who barricaded themselves inside the Woodlawn Mental Health Clinic on Chicago’s South Side on Friday to protest its planned closing. Ten Cuban former political prisoners protesting their “total abandonment” in Spain launched a hunger strike on Friday to press their demands for government assistance.